We did something so fun with our recipe for this week’s show! 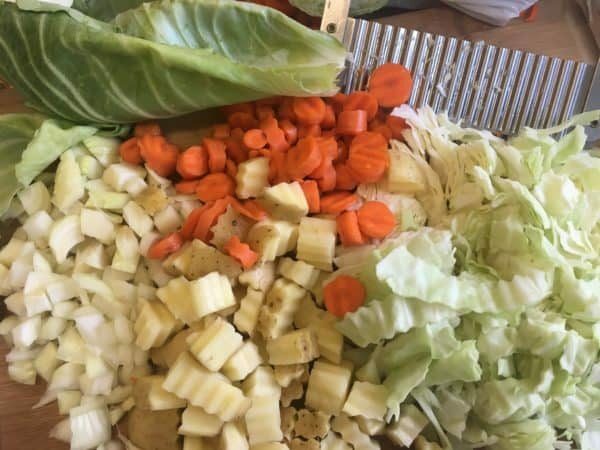 We asked our Quick and Carry community of amazingly cool people to submit recipes that use cabbage, and we offered a box of our awesome Quick and Carry utensils for the Instant Pot as a prize for the chosen recipe. 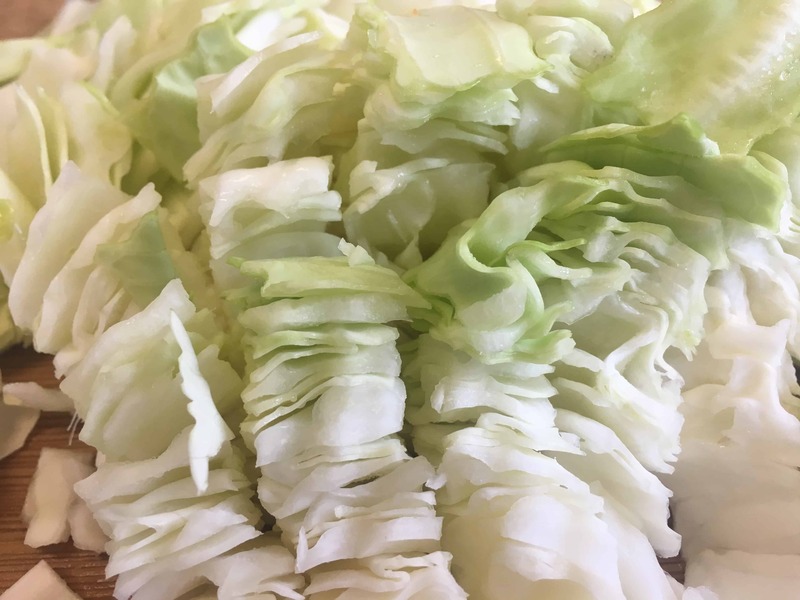 We wanted to use cabbage as that is what is coming out of our gardens up here in NoMi, and, our favorite farmer, Joan Olds, told me she had plenty! We had quite a few people send us recipes either by putting the link on our Facebook page, or by sending is a message. Dev Daniel from Texas sent us a great and unusual recipe, and that is the one that was chosen to get made live on our show! Thanks, Dev! This is a golden, cream soup with perfectly balanced flavors. We served it for lunch with a load of rye, just made this morning at Pleasanton Bakery here in Traverse City. Oh, what a great lunch that was. I am happy to be taking home some leftovers today! Congratulations to Dev, and thanks again to everyone who wrote in! 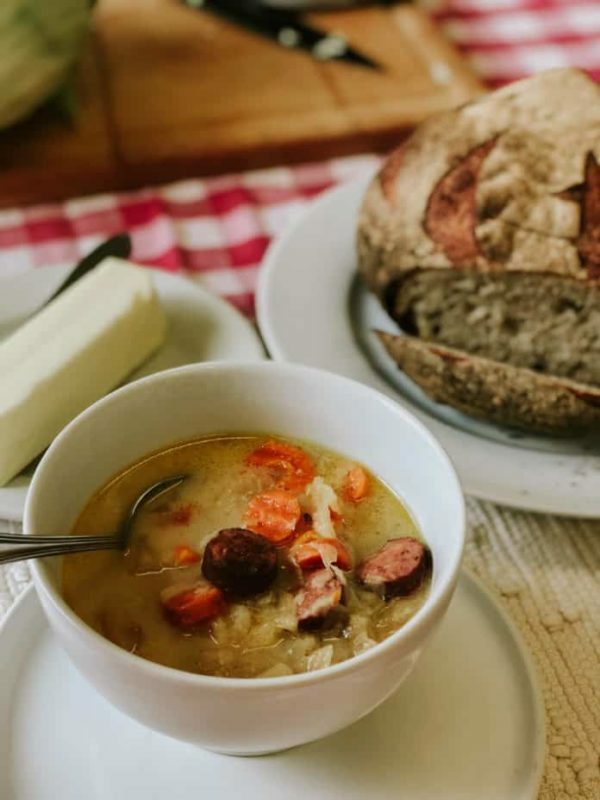 Irish Stew in the Instant Pot! Set the Instant Pot to saute mode and add the oil. 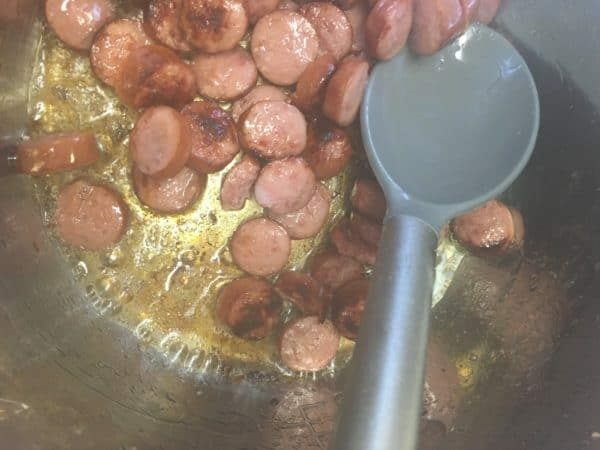 Cut the sausage into rounds and cook in the oil until they are nice and brown. Add the onion toward the end and cook for three or four minutes, stirring often. Deglaze the pan with the chicken broth, scraping up any browned bits on the bottom of the pan. Add all the rest of the ingredients and stir well. The combined ingredients will come up almost to the fill line. Set manual/pressure cook for 25 minutes. Allow a 5 minute pressure release. Add in the coconut milk and stir well. Taste to adjust seasonings. Serve with a nice rye bread! Just wondering why coconut milk is used instead of regular milk? It is something I never have in the pantry. Could I sub with something else or should I go to the grocery store? The coconut milk is delicious in this recipe but it could easily be replaced with evaporated milk. I would NOT use almond milk as it is too thin.